Employee training and development is one of the most critical factors in building engaged, high-performing teams. While many businesses conduct ongoing product and process training between managers and employees, there are significant opportunities to develop new skillsets by hiring outside training providers. Training providers (also referred to as training vendors) can help your team overcome skill gaps and nurture internal expertise on a wide range of competencies critical to your business’ success. While many training providers are available to support your training, how can you ensure you’re hiring the best trainer? Determining your training needs, maintaining a focused trainer search, sourcing multiple vendor quotes, and committing to your training plan are essential to choosing the right training provider. Since this is such an important decision to make, take your time to develop a plan. Being proactive in your approach to training is the best way to make sure your team is getting the skills it needs – it also helps to offset a portion of training costs with government funding programs! First, you’ll need to specify exactly what you’re seeking from the training program. Starting with your organization’s needs is essential to making sure that you’ll receive the best training possible. Since most training providers offer customized solutions, it’s worthwhile to envision your ideal training program, then find providers that have standard solutions (or can develop custom ones) to fit your needs. Map out your starting point (the current state of your organization’s skills), then identify where you’d like to be post-training. The gap created between starting and end points provides a blank slate for which your training provider can map a plan for success. What does training need to achieve? What is your timeline for start and completion? Once you’ve developed a basic training plan, it becomes much easier to start exploring training providers that can deliver your ideal training solution. Next, you’ll need to develop a list of trainers that can deliver the type of employee training required. It’s recommended that you complete this step as a two-phased process. First, start with a general list of all corporate training providers you can find that might be a fit. Don’t discriminate here; build a large list that you can use for later research. Step two involves filtering out non-ideal training providers based on criteria you set for your organization. Developing criteria to evaluate training providers is highly personal to your company’s needs. Make sure to identify criteria that will help you make the best choice possible. Method of Delivery: Is the course structure focused on modules that are relevant to your training needs? Does the course presentation style (online, classroom, production floor) provide optimal support for the subject? Trainer Background and Experience: What accreditations does the trainer have? How long have they been providing this, or similar training programs? What feedback is available to gauge the experience of previous trainees? Fit with Company Culture: Does the trainer have a similar approach to operations (such as sales/marketing strategy) as your company? Will their training reinforce and be consistent with management’s goals for training? Training Customization Options: Is training provided as a one-size-fits-all solution, or can the program be adapted to make the experience more valuable to your organization? Assessment of Learning: How will employees “complete” the training? Are they simply required to participate in all sessions, or is there an evaluation process following the training that ensures the retention of knowledge/skills? Use these criteria and any others that seem relevant to your business or training program to eliminate training providers that do not fit your requirements. It’s best to have a list of 3-5 suitable vendors at this point so that you can request multiple quotes. With a focused view of potential training providers, reach out to each one that’s on your shortlist and request a quote. The goal here is to compare each one as evenly as possible, so be specific on your training requirements and make sure that each quote accomplishes your training requirements. Be cautious in evaluating training quotes to ensure critical components are not missed and you’re not being quoted on unnecessary elements. Comparing each training provider with an “apples to apples” mentality will reduce variability between quotes and help you make the right decision. Was the training provider accurate in quoting you for what you asked for? What is the base price of training? Does the price fluctuate with more or fewer participants? What is the timeline for training delivery? Are there fees associated with adapting the training to your company’s needs? Take your time to ensure that you’re assessing the merits and shortcomings of each training provider. Lowest or highest cost does not always equal the worst or best training options. Make sure you’re diligent in checking into each provider and assess the best return on your training investment. With a single training provider chosen, start to put the pieces in place for completing the training. Sign a contract with the training provider that locks in your price and delivery date(s). Send all trainees calendar invitations to ensure they have time booked off to attend the training. If there’s any prep work that needs to be completed by your management team or trainees, ensure that this is also completed prior to your start date. At this point, you should also apply for training grants. Canadian government funding can typically support up to 50-83% of third-party training costs to a maximum $10,000 per trainee. It’s recommended that, if you’re accessing training grants, you apply a minimum 3-4 weeks ahead of the training’s start date; this ensures the application has time to be reviewed and processed. Applications must receive approval prior to the start of training to qualify for funding, so having all your documentation in order well ahead of the training’s start date is a key to success. Following the steps outlined in this article will help streamline your training provider selection process, but there are many other ways that your company can strengthen its workforce development plans. Hiring and training projects are two areas that receive considerable financial support from Canada’s federal and provincial governments; to get the most out of your employees, you should develop a plan that taps into these funds as much as possible. 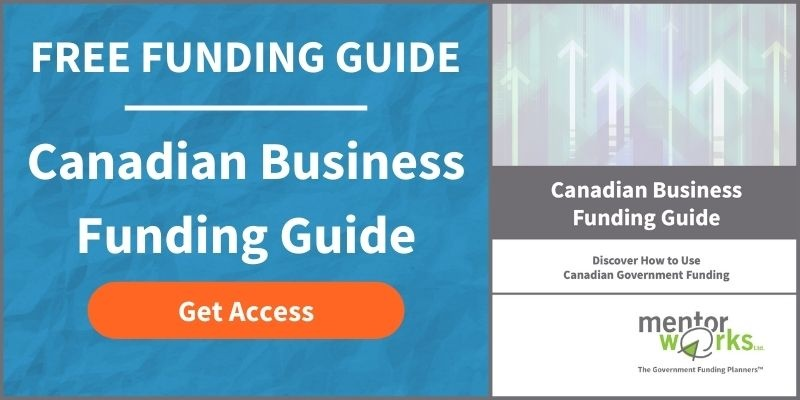 To help you identify the opportunities available with hiring and training grants, Mentor Works provides the Canadian Business Funding Guide, a complimentary resource that reveals areas your business can invest in to potentially receive government grants and loans. Access it today to learn more about hiring and training grants, and other types of government funding!